While some might consider it as an attempt to counteract or even undermine yesterday’s press conference conducted by Prime Minister Dean Barrow, in which the GOB rolled out a proposed infrastructure plan worth $200 million dollars, Leader of the Opposition, Hon. 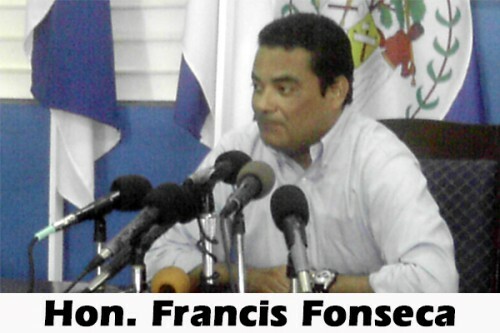 Francis Fonseca, single-handedly staged a press conference this afternoon at the PUP’s Independence Hall. Fonseca opened the press conference with the news that the People’s United Party (PUP) has submitted approximately 2,003 petition signatures to the Governor General – all in support of a recall of current Cayo North East area representative, Hon. Elvin Penner. According to Fonseca, a “writ of referendum” will now be issued for the Cayo Northeast constituency 15 days after the signatures have been reviewed. That is expected to be around January 15th of next year. He also conceded that it will be an “uphill battle”, but he maintained that the PUP is committed to seeing the process through and achieving the difficult 65% threshold that stands almost as an impediment to the procedure. Thereafter, he touched on the present impasse between the cane farmers and BSI/ASR. He described the PM’s response to the crisis in the sugar industry as “woefully inadequate,” given that he believes that the situation requires immediate intervention since it has the potential to affect the entire economy of the country. Fonseca went on to denounce what he called the “arrogance of the Prime Minister in his not-so-veiled threat” that the government will not fix the sugar roads if the farmers don’t come to an agreement with BSI/ASR, and added that no precondition should have been placed on the situation. He said that he and the 5 PUP area representatives from the North had met with the cane farmers on November 20, and they had also met with the representatives of BSI/ASR. Both Fonseca and PM Barrow now have stated that they stand firmly with the cane farmers, and Fonseca also agreed that bagasse has a value. As a matter of fact, Fonseca affirmed that sugar, molasses and bagasse each have their own values, since they are capable of bringing in their own revenues. The Leader of the Opposition was also up in arms because he claimed that no update was provided on the Penner issue. He questioned, “What is the police doing?” and suggested that there should have been an update provided because the Belizean people deserve to know the status of the investigations. On the subject of the alleged ministerial visa hustling, he said that he finds it “very disappointing” that Hon. Edmond Castro has provided written recommendations for over 30 Chinese nationals over a 3-week period, and that the PM continues to defend Castro by “moving the goal posts”. He told the media that he wanted to find out if Castro knew all the Chinese nationals whom he recommended, and if he did not know them, then what was his motivation for signing 30-plus recommendations over a 3-week period. Fonseca informed the gathering that they (PUP) have been speaking with the people of Belize Rural North in hopes of launching another recall petition, which might be in the making after the PUP’s Rural North convention in the next few weeks. For the upcoming year, Fonseca promised that the PUP will be launching a social justice agenda on January 18, which is the birthday of former PUP Leader George Cadle Price.